All orders are submitted via a secure connection (128 bit Secure Socket Layer) and then your credit card information is encrypted and stored in a password protected database. Security is our first priority here at American Foreclosures, Inc. and you may rest assured we have done everything possible to earn your peace of mind. American Foreclosures, Inc. has created this privacy statement in order to demonstrate our firm commitment to privacy. The following discloses the information gathering and dissemination practices for this Web site: americanforeclosures.com. It is the policy of American Foreclosures, Inc. to respect the privacy of its visitors. American Foreclosures, Inc. will not disclose any personal information about you or your use of our Web site services without your prior permission unless American Foreclosures, Inc. has a good faith belief that such action is necessary to: (1) conform to legal requirements or comply with legal process; (2) protect and defend the rights or property of American Foreclosures, Inc.; (3) act to protect the interests of its members or others. American Foreclosures, Inc. does provide certain visitor information in aggregate form to third parties, including its advertisers, for demographics. This site contains links to other sites. 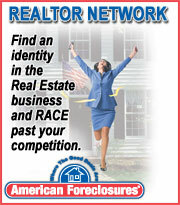 American Foreclosures, Inc. is not responsible for the privacy practices or the content of such Web sites. If you have any questions or comments about this privacy statement, the practices of this site, or your dealings with this Web site, you may contact American Foreclosures, Inc. at: customerservice@americanforeclosures.com.